Review of a great documentary about mother-daughter relationship. What lies hidden behind the word “love”? Two women meet in a psychotherapist’s consulting room. In an intimate dialogue between these three people, psychological injuries from the past and deeply concealed emotions gradually come to the surface. The therapist takes the women on a difficult journey towards a better relationship. You Have No Idea… shows family therapy in five acts. These are clearly delineated: introduction and problem-setting, starting point of the problem, effect on the one, effect on the other, and closure to move forward. Lozinski contrasts the complex content of the fim with an extremely stylized form. All shots consist of close ups of the three protagonists and although a shade of one of the others is visible every now and then, which points to a multiple camera registration, the close ups of the faces separate the three individuals and ties them closely to their role as mother, daughter and therapist. A neutral, grey background and flat lighting provide no escape from the central faces. Black screens separate the different sessions but the constellation of the triangle of people remains the same throughout. The camera observes, but not quite, as the editing of faces in relation to what is being said, can be read as a comment. Behind this straightforward and simple surface devoid of any decoration is the knot that needs to get untied. With so little diversion, we can put our complete attention to what the two women have to say and how the therapists does his work: he listens, keeps the focus, takes the flak, probes to make sure feelings are described accurately and precisely, provides comfort, challenges, and functions as lightning rod, all in he most attentive manner imaginable. The sessions revolve around the loneliness of the mother and the alienating effect it had – or mum’s related behaviour had – on her daughter. An overwhelming yet suffocating love stands between them. Communication between the two has come to a halt as a result. Slowly the related bits of family history are revealed and we come to understand the traumas and the situation of both women. And by persisting in the need to find the right words to describe feelings and phrase them exactly and precisely, the therapists teaches them to utter themselves and thus to communicate properly. The film also testifies to the difference between therapeutic films and films on therapy. The former serve as therapy for the filmmaker but ar rarely relevant or meaningful to an audience. The latter, of which You Have No Idea… obvisouly is one, reveal something about the way people get hurt and how to deal with that. In this case, it is the emotion of love that is at the core of the a complex problem. Łozinski is well known for his films about people: observational studies of behaviour. In You Have No Idea… he, with the therapist, slowly but carefully unravels the devastating effect people can have on each other without knowing or realizing it, let alone intending it. Despite the fact that it is a 75 minutes film with talking heads, which sounds horrible, I watched with fascination. At the end, there is twist, which some may have more problems with than others. For those who trust in the power of stories to provide insight in the human condition, this film can be very rewarding. For those who seek the truth, it might be more troublesome. “Could you write something about relationships?” asked my friend. Yes. I could. Sure. No problem. The words of Khalil Gibran “Fill each other's cup but drink not from one cup” rang in my head, but I wasn't quite sure if that’s what she had in mind. I imagined writing an elegant one or two pager in a few minutes. Only when I started to really think about the subject of her request, questions piled up: What specifically would she like to know? Which relationship she had in mind? The one we have with ourselves or with our partner? Spouse? Friend? There is such a wide range of relationships and their many aspects that we could write volumes about them. Actually many volumes have already been written, and ongoing research adds new data to what we already know. We’re involved, engaged and connected in many different ways, and the constantly evolving social media brings about additional possibilities. So what did she have in mind? Of course I could ask my friend if she wanted me to write about a particular kind of relationship, or perhaps select a relationship of my choice. It would have been an easy way out for me as I’ve already written a book about the mother - daughter relationship. So take a bit from the book, make it into a short text and you got your thing on relationships, my friend. Yet, upon reflection I decided to take a different route. One that would invite you, the reader, to challenge yourself to look at the people in your life, and ask a following question: What can I do to cultivate my relationship garden? I went to look for the answers at the ‘love lab’ created by a psychologist John Gottman, who was named one of the most influential therapists of 21st century. He has been studying relationships for decades and found specific attitudes that damage intimate relationships. Yes, I understand, that this is not a straightforward response to ways of cultivating your relationship garden. Yet in order to learn how to make our flowers bloom we’ll definitely benefit from knowing what harms them. 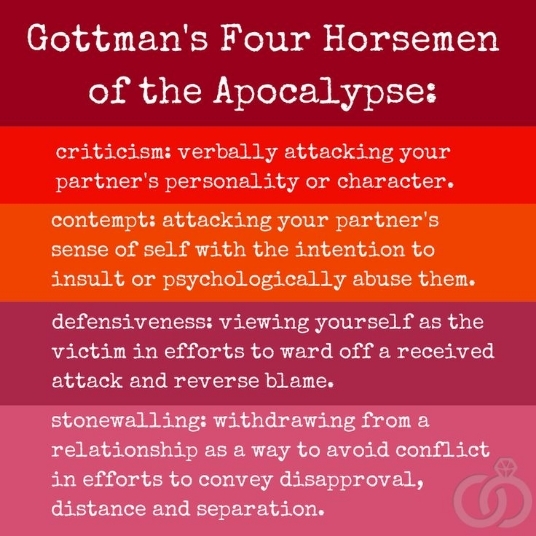 According to Gottman the deadliest poisons of relationships are: criticism, contempt, stonewalling and defensiveness. He calls them The Four Horsemen of the Apocalypse. He asserts that these negative patterns can drag relationships to the ground, with contempt being the strongest of the poisons. What I like about his approach is that it offers clear antidotes to these destructive relationship patterns. Thus criticism can be replaced with “I” statements, and talking about our own preferences. The antidote to criticism is to make a complaint –to name feelings and describe the situation using words like “I’m upset that the fence has not been fixed” instead of “You’re too lazy to fix the fence”. In Gottman’s words: "The attitude of criticism is really a spillover of self-criticism, a real habit of mind, that the critic applies to the world and to themselves. They tell themselves "you don't deserve this raise" "you don't amount to a hill of beans", "You're worthless", etc. The self-dialogue of these people, where they tell themselves all these negative things, it spills over into the world. It is really "a habit of mind" that you apply to everything, to be very involved in other people's mistakes. The antidote is not to be involved in other people's mistakes - let them make mistakes - but to be involved in scanning for what's working, and what's right. The antidote to contempt is to create in the marriage a culture of appreciation”. And the culture of appreciation requires expression of fondness on regular basis. To let go of defensiveness and self-protection against a perceived attack, we need to realize that what’s called for is not retaliation, but acceptance of responsibility for at least a part of the problem. And what’s the antidote to stonewalling? Since stonewalling is the withdrawal from relating either physically or emotionally, and is expressed by silence or statements such as “yeah, yeah” and “whatever”, we need to take a break to focus on self- soothing, calming down (while remaining connected). In practical terms it can be a 20-30 minutes pause with clear indication of the return to the conversation. Thus to cultivate our relationship garden we need to start putting our feelings into words. We need to express respect for each other. Build the culture of appreciation. Accept responsibility for our actions. Take care of our emotions. Become self-aware. Assert ourselves with gentleness, understanding, and compassion. Did you notice that ingredients of the relationship with a life partner are closely linked to the relationship we have with ourselves? To cultivate our relationship garden we need to start being aware of our own needs, wants, preferences. Our values and our dreams. The basic ingredient of a relationship - the state of being connected - can be acted upon only in the state of self-awareness. When you’re out of touch with your inner world you cannot show up for relating with another. Regardless of whether it’s your life partner or your friend. You will not be able to deepen the connection with the other person when you’re oblivious to what’s happening inside you. Equally, even if you are connected to your inner world, you will not be able to deepen the connection with an emotionally unavailable person. No amount of open-ended questions, compassion and empathy will create the state of being connected if the other person is not ready to show up for relating. They will remain unresponsive to your reaching out to them. Whether trough criticism, contempt, defensiveness or stonewalling they’ll remain out of the partner’s reach. Their inner disconnection will be projected and played out with the other person. Thus the very first step in cultivating your relationship garden is to attend to yourself. To develop a close relationship to yourself. To know yourself. To meet the person you are. Please, do schedule the visit to your inner world. You could start with connecting with your body. This can be done trough yoga or other mind-body practice. You can embark on the journey of mindful meditation that will lead towards observing your mind and connecting inward, reaching your deeper wisdom. Touching the knowledge that comes from within. Take the time for regular visit with yourself. Emphasize listening to your needs and wants. Attend to them. After becoming more and more accessible to yourself, you might want to start addressing your losses, fears and dreams. Sometimes it requires talking things out with a therapist. Yet you can start to practice self-compassion and loving-kindness right away. Then you will be truly prepared to connect with others from the place of emotional accessibility, responsiveness and engagement.